I think I may have just done more for world peace than any U.N. peace treaty ever could. I made a currywurst taco. I don’t remember where I first heard about currywurst, but it’s important to note that I’ve never actually had currywurst until today. Even when I was in Germany, I had plenty of sausages, but never had currywurst. I guess that’s a sort of disclaimer, since I have nothing to compare it to. But if authentic German currywurst tastes like what I whipped up, I can see why it’s popular. The legend of currywurst is that a simple woman in post-WW2 Berlin traded some booze with British soldiers for ketchup, curry, and Worstchestershire sauce. She threw them together in her kitchen with a few other spices, poured it over sausage and the rest is history. Now the stuff is everywhere over there. Still, there’s plenty about the dish online, and I found this Wall Street Journal article quite enlightening. After scouring various articles and recipes online, it’s clear that few people agree on how to make the sauce that makes currywurst so delectable, and there appears to be some difference of opinion on what one should serve with currywurst. Well, in adapting this for a taco, essentially I did this. For each taco: one Hofbrau beer brat from Trader Joe’s, served on a medium wheat tortilla, topped with a curried tomato sauce, and sauerkraut. It was amazing. First the sauce. There are many simple recipes online that amount to essentially currying ketchup. I wanted something a little more refined than that, and I really didn’t want anything as sweet as ketchup. So here’s what I came up with. I found this recipe and made several twists and omissions, all changes I think were important. I sauteed about 2/3 cup of chopped onions and 1 clove of minced garlic in oil for a few minutes, then I added a small amount of water and stirred to kinda clean up the pan. I turned the heat off, and added: 10 cherry tomatoes (sliced in half), 1/4 cup vinegar, 6 ounce can of tomato paste, 2 tbs. honey, 1/4 tsp of ground allspice, 5 tbs. curry powder (yeah, I said FIVE freaking tablespoons), 1 tsp. ginger powder, 1 tsp. cayenne pepper, 1 bay leaf, and a little salt and pepper. I turned the heat back on, and simmered, adding quite a bit of water, probably about 1-1/2 cups, but I only did it a quarter cup at a time. Over the course of 25 minutes or so of simmering and occasionally stirring, a lot of water dissipated. In the end, the consistency I wanted with a chunky, slightly thick ketchup. And damn, it was tasty. Meanwhile, I browned the small wheat tortillas in a separate skillet, doesn’t take long, and set them aside. I threw the brats in the skillet, and ended up breaking them down by chopping with a knife and separating them with the spatula until it had the consistency of ground meat. 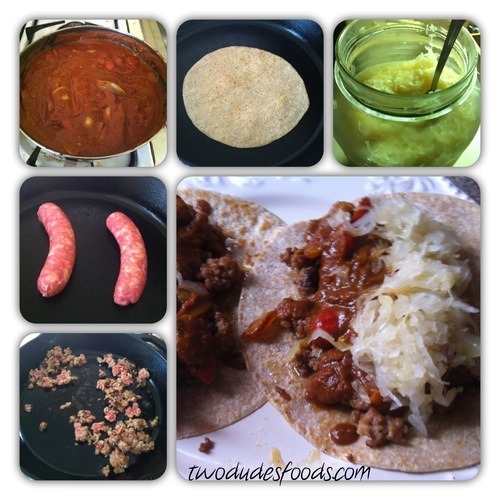 Once everything was cooked thoroughly, I removed the bay leaf, spooned the sausage onto the tortilla, topped with a generous helping of sauce, and sauerkraut. I served with a big glass of water, but a large mug of German beer would have been even better. As far as quantities…I used about a full brat on each tortilla, though the Trader Joe’s brats are relatively small, and I think the amount of sauce would work well for 4-6 tacos of this size. Who woulda thunk? India, Great Britain, Germany, and Mexico, united in one damn fine dish. That looks thoroughly delicious. And that’s something I could easily do camping – freeze and vacuum seal the brats ahead of time, and then dehydrate the sauce. Either way, home or in the woods, this is happening. It’s super good. I just had some leftovers, and it was great. I took the sausage out of the casing this time, and it was much easier to break apart (duh). Full disclosure: I actually wanted to slice the brats to give it a more traditional (German) appearance, but my cuts were ugly, so I decided to go with the ground meat look! I think that actually was better, especially because it created pockets in the taco for the sauce to fill, likely making it less messy. These things are pretty juicy, between the sauce and the kraut. Take some big paper towels for a cleaner experience.